What I will major in is unknown to me at this time. I feel that I am about to reach a major crossroads in my life, and the fact that I do not know what my field of study will be is weighing on me. I enjoy writing. Science intrigues me. Business is always a possibility. I know I will find that place where I belong, my niche in life. In case you haven’t heard, I have joined the ever-growing number of Eagle Scouts across the country who are turning in their awards in protest over Boy Scouts of America’s anti-gay policies. I first announced my position here on my blog and then I cross-posted over to the Huffington Post. Three days later the Huffington Post approved the post and placed it on their front page for more than a day. Adam and I snuggled in the woods beneath our makeshift lean-to. We were 14. We weren’t gay; we were cold. If we were gay, we would have been booted from Scouts, at least according to the discriminatory policies of the Boy Scouts of America’s national leadership. We adhered to our own don’t ask don’t tell policy. When our Wilderness Survival merit badge instructor asked us how we survived our night alone in the woods, we left out all the details about spooning and just told him about the structural integrity of our shelter. Adam and I both went on to become Eagle Scouts. You can barely press an on button in the last 24 hours and not see someone in Congress complaining that the USA’s Olympic uniforms designed by Ralph Lauren were made in China. Yes, it’s an election year, but one of the most outspoken members of Congress Senator Sherrod Brown has always been outspoken on this issue. He suggested that Hugo Boss could have designed the uniforms and manufactured them in his home state of Ohio where they have a factory. 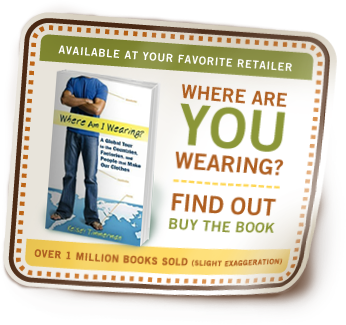 Winthrop Students receives copy of WHERE AM I WEARING? I am blown away by the amount of schools using WEARING in their common reader programs this year. In case you are wondering what a common reading program is: They are typically directed at freshmen. 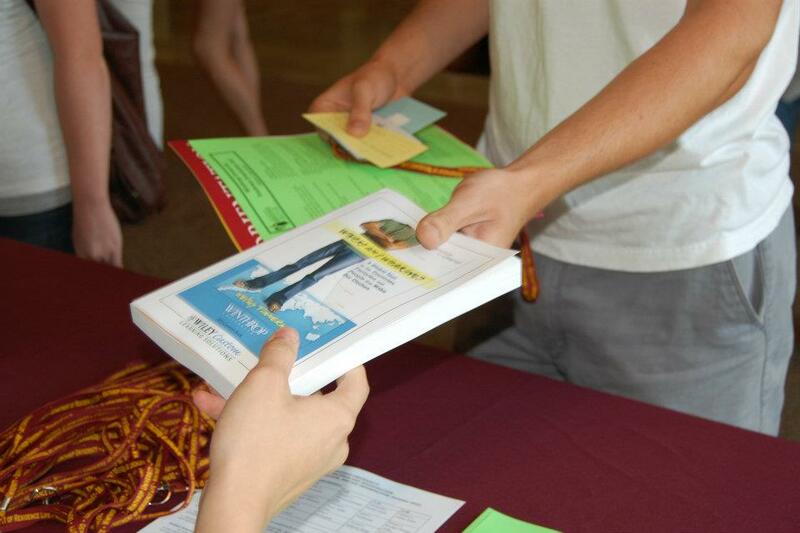 Every freshmen gets a copy of the book and participates in discussion sessions about the book in the Fall. Normally they invite the author to speak as well. Every Community has a story. What’s yours? Poverty is a hot button issue in the Muncie and Delaware County communities, as it is nationally, and internationally…. The young couple jokes and laughs over their entrees. She forks him some steak. He spoons her some soup. I imagine delicately slamming their faces into their mashed potatoes. But when our 1-year-old chucks his milk, splattering it everywhere, and our three year-old-starts to cry about us not letting her sit upside down on the table with an elephant (or something), I look at them and apologize.